This was probably the biggest we've ever seen. It took 10 minutes for the thousands of students to make it through the Strathmore Ave. tunnel. Last night's Undie Run was definitely different than years past. 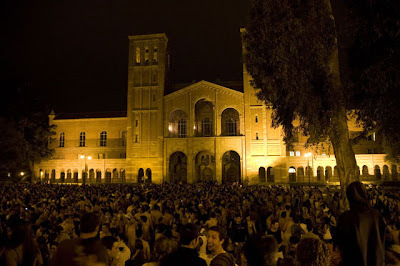 After UCLA administrators threatened to ban the event from occurring, the student body stepped in and found a compromise: change the route to end at a more secure and well-lit location. Whether that contributed to last night's lower turnout--around 1,000 students instead of the usual 2,000-3,000--or not, the tradition's flavor has definitely changed. However, for better or worse, those who ran had a blast. 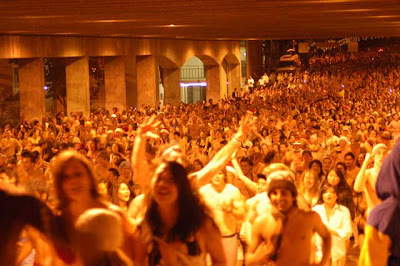 Although the Undie Run has been around since 2002 (in lieu of the Midnight Yell), major media outlets really didn't start to catch on until a few years ago. Last night, ESPN, NBC, FOX News and four LA Times staffers were seen at the event. One of the other reasons why campus officials wanted to change the route and ending location was because too much damage and repair costs incurred. Here's one part overlooked: everyone is hurdling over this brick fencing into landscaping. UCLA Campus Police did not break out the tactical riot gear for the Fall Quarter.